Pedestrians wear masks while walking through San Francisco’s Financial District on Nov. 9. For two weeks after the Camp Fire ignited, the air in Northern California, stretching as far as 200 miles from the flames, was so full of smoke that it was deemed unhealthy to breathe. Three days after the Camp Fire erupted, incinerating the Northern California town of Paradise and killing 85 people, Katrina Sawa found herself struggling to breathe. If you or someone you know has had breathing problems or heart problems or had to seek medical care in the wake of the recent fires, we want to hear from you. Text “fire” to 63735 and follow the prompts, or reach out to reporter Aaron Glantz at aglantz@revealnews.org. But Sawa wasn’t anywhere near Paradise. She lives almost 100 miles away in Roseville, a suburb northeast of Sacramento. Sawa puffed on her emergency asthma inhaler over and over again. “Usually, I use it once a month,” said Sawa, a 48-year-old businesses coach who has had asthma since she was 13. “After using it four times in one day, I knew it was time to go to urgent care.” There, doctors had her inhale a powerful steroid medication to soothe her inflamed airways. But the health problems Sawa and others experienced while the blaze raged are just the beginning of effects that could plague people from Sacramento to the San Francisco Bay Area long after the smoke clears. 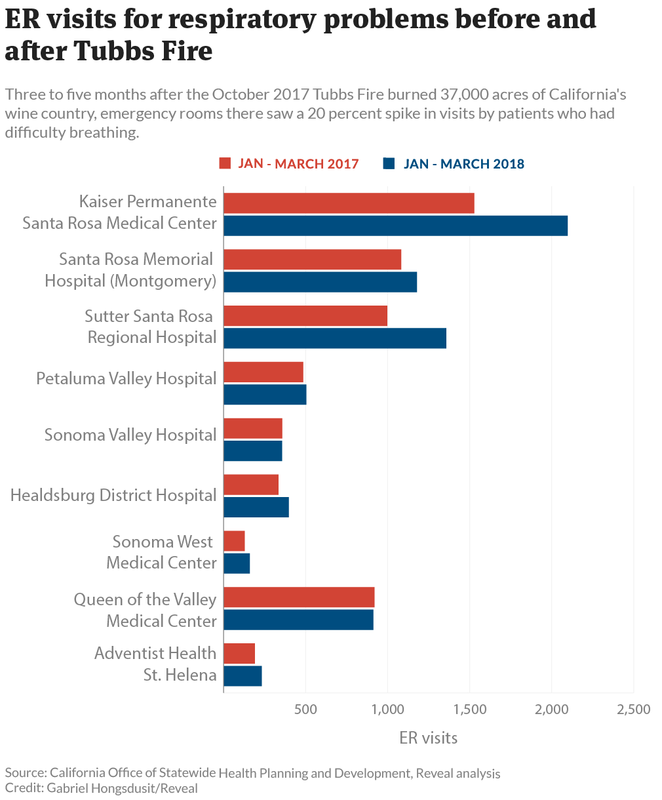 An analysis of hospital data by Reveal from The Center for Investigative Reporting found that emergency room visits surged several months after a previous large wildfire was extinguished. 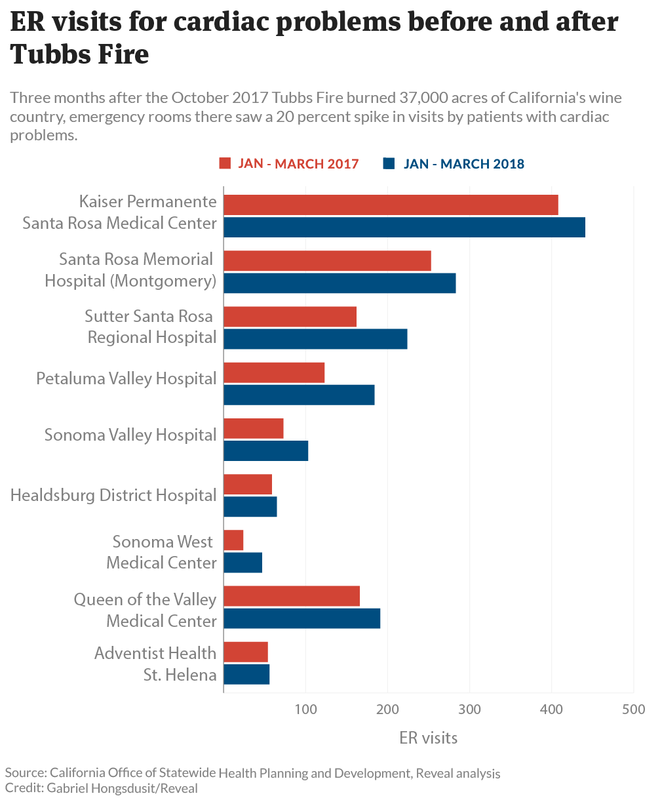 Three to five months after the 37,000-acre Tubbs Fire in Napa and Sonoma valleys in October 2017, the region’s emergency rooms treated about 20 percent more patients for respiratory and cardiac ailments compared with previous years, according to the analysis, which used state data. 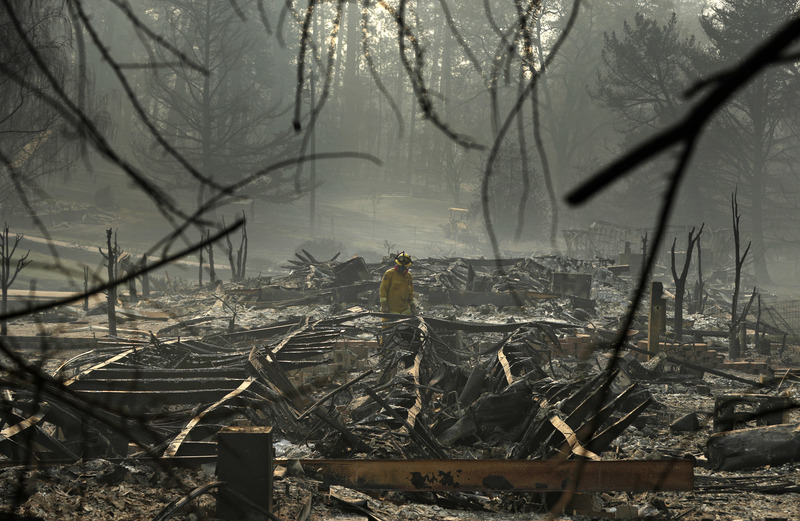 At the time, the Tubbs Fire was the most destructive in California history, killing 22 people and destroying nearly 6,000 structures. Seven of nine hospitals in Napa and Sonoma counties reported either significantly or slightly more cardiovascular and respiratory cases from January through March 2018 compared with the same period in 2016 and 2017. For instance, at Kaiser Permanente Santa Rosa Medical Center in Sonoma County’s largest city, emergency room visits for respiratory problems jumped by 570, or 37 percent, from January through March 2018 compared with the same period in 2017. Twenty miles down Highway 101 at Petaluma Valley Hospital, heart cases increased by 61 patients, or 50 percent. Medical experts say these findings raise troubling questions about the long-term health effects of wildfires, which, worsened by drought and global warming, are raging across the West. The life-threatening effects of smoke disproportionately harm the elderly, children and low-income people of color. More than 2.3 million adults and 644,000 children in California have asthma and another 1.7 million suffer from heart disease, according to the Centers for Disease Control and Prevention and California Department of Public Health. Adult asthma rates are highest for multiracial people and African Americans, while heart ailments tend to afflict the state’s poorest and least educated residents across all racial groups. This month’s Camp Fire – the deadliest and largest in California history – was more than four times bigger than the Tubbs Fire. 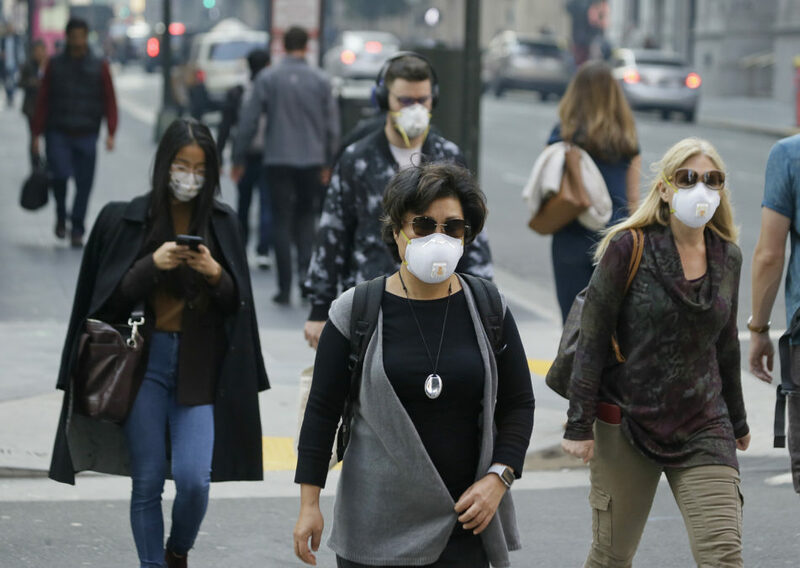 Throughout much of the Bay Area and Sacramento area, the smoke was so intense and widespread that many people wore masks, stayed indoors and bought air purifiers. At least two Northern California hospitals have reported busier ERs due to smoke from the fire, which burned 153,000 acres in the foothills of the Sierra Nevada. Robin Scott, director of the emergency department at Adventist Health Clear Lake, reported a 43 percent increase in respiratory diagnoses when the smoke hung over the region compared with the two previous weeks. In Berkeley, 160 miles from the fire, Sutter Health’s Alta Bates Summit Medical Center treated “increasing numbers of patients with chief complaints that appear to be connected to the poor air quality,” including “asthma, eczema, respiratory illness – as well as worsening heart conditions like congestive heart failure and chest pain,” said Dr. Ronn Berrol, medical director of the emergency department. Other hospitals in the region, however, reported small increases, while some, including Kaiser Permanente in Oakland, reported no increases. Francesca Dominici, a biostatistics professor at Harvard University’s T.H. Chan School of Public Health, said understanding the health effects is critical because climate change is making fires more frequent, ferocious, erratic and long lasting. Dominici was on a team of researchers that published a study last year that collected data from wildfires across the West between 2004 and 2009 and compared it with hospitalizations of elderly residents. About 22 percent more African Americans 65 and older were hospitalized for respiratory problems on smoky days than on non-smoky days. For elderly women of all races, respiratory hospitalizations increased more than 10 percent on smoky days, and for elderly men, 4 percent. Five of the 10 largest wildfires in California history have occurred in the last two years, and many of the state’s largest population centers have been exposed to smoke repeatedly. Dominici said the impacts are likely cumulative. “More people are becoming susceptible to air pollution because they have been breathing bad air from previous wildfires,” she said. “For these people, the risk of adverse health effects is going to be even larger than the rest of the population. U.S. Environmental Protection Agency researchers, in a study published in April, examined more than a million emergency room visits during California’s 2015 fire season and found a 42 percent increase in heart attacks among adults over 65 on days with dense wildfire smoke. They also found increases in strokes and other cardiovascular effects. The EPA researchers expressed a willingness to speak about their research, but the agency would not grant permission. A major health concern is the makeup of the smoke. Fires emit clouds of fine particles known as PM2.5. For decades, researchers have shown that whenever these tiny particles – which largely come from vehicles and other sources of fuel combustion – increase in the air, deaths and hospitalizations from heart attacks and respiratory problems rise. The particles can irritate airways, travel deep into the lungs and disrupt the heart. In addition, fires can emit toxic gases from a variety of sources, including oil, metals and pesticides. Among the estimated 19,000 buildings destroyed in the Camp Fire were gas stations, two grocery stores, eight schools and a hotel. The long-term effects of breathing this cocktail are unknown. In Palo Alto, 200 miles from the Camp Fire, pediatrician Dr. Kellen Glinder said he has seen a marked increase in number of children with breathing problems during each of California’s recent wildfires. On Friday, after rain cleared much of the wildfire smoke, the waiting room at the Palo Alto Medical Foundation, a clinic where Glinder works, wasn’t as busy as it was in previous days. Several children sat or crawled around as a television played “Toy Story” overhead. But Glinder said he still was treating kids affected by the smoke. About one-third of the 20 children he treated each day during the fires – six to eight kids per day – had conditions the smoke exacerbated, Glinder said. “We (saw) a lot of things hidden under the guise of a cold that wouldn’t have gotten worse unless the air quality was so bad,” he said. In August, when the Mendocino Complex Fire blazed through the state, Glinder treated more patients with asthma and other conditions. And last year, the Santa Rosa fires brought similar health concerns. The waiting room had a box of miniature paper masks for the kids, decorated with Mickey Mouse heads. Glinder, however, said such flimsy masks are ineffective at protecting people from smoke’s particles and gases; they are designed to contain germs from colds and flu. Like the elderly, children are particularly sensitive to soot and smoke. This story was edited by Marla Cone and copy edited by Nikki Frick. Aaron Glantz can be reached at aglantz@revealnews.org, and Susie Neilson can be reached at susancneilson@gmail.com. Follow them on Twitter: @Aaron_Glantz and @susieneilson.